"When we label anyone 'bad', we will have more trouble dealing with him than if we could have settled for a lesser label." "Why do we pigeonhole and label an artist? It is a sure way of missing the important, the contradictory, the things that make him or her unique." 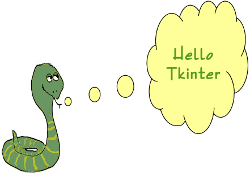 We will start our tutorial with one of the easiest widgets of Tk (Tkinter), i.e. a label. A Label is a Tkinter Widget class, which is used to display text or an image. The label is a widget that the user just views but not interact with. There is hardly any book or introduction into a programming language, which doesn't start with the "Hello World" example. We will draw on tradition but will slightly modify the output to "Hello Tkinter" instead of "Hello World". To initialize tkinter, we have to create a Tk root widget, which is a window with a title bar and other decoration provided by the window manager. The root widget has to be created before any other widgets and there can only be one root widget. The pack method tells Tk to fit the size of the window to the given text. Our script will remain in the event loop until we close the window. As we have already mentioned, labels can contain text and images. The following example contains two labels, one with a text and the other one with an image. If the compound option is set to BOTTOM, LEFT, RIGHT, or TOP, the image is drawn correspondingly to the bottom, left, right or top of the text. Some Tk widgets, like the label, text, and canvas widget, allow you to specify the fonts used to display text. This can be achieved by setting the attribute "font". typically via a "font" configuration option. You have to consider that fonts are one of several areas that are not platform-independent. The attribute fg can be used to have the text in another colour and the attribute bg can be used to change the background colour of the label.